Norway’s $1tn sovereign wealth fund is set to sell out of a host of oil and gas companies but stop short of abandoning the biggest energy majors such as BP and ExxonMobil as it prepares for one of the largest divestments of fossil fuel assets. The Norwegian oil fund, which is the world’s largest sovereign investor, would dispose of about $7.5bn of oil and gas companies that are focused purely on exploration and production under the proposal from the centre-right government in Oslo. The move is designed to reduce the dependence of Norway — western Europe’s biggest petroleum producer — on an industry that is facing growing questions about its long-term future. Global oil demand is forecast by many experts to peak by the 2030s while climate targets are speeding up efforts to reduce dependence on fossil fuels. Financial Times: "Shockwaves through the energy sector"
Energy Priorities, Geo-politics & Fracking in the U.S.
"The greater the change to the chemical composition of the physical, chemical makeup of the oceans and atmosphere [due to increased carbon emissions], the greater the long-term effect will be... [W]hy would you run this crazy experiment to see how bad it'll be? We know it's at least some bad, and the overwhelming scientific consensus is that it'll be really bad." The author, Matthieu Auzanneau, is the director of The Shift Project, a European think tank focusing on energy transition and the resources required to make the shift to an economy free from fossil fuel dependence, and also from greenhouse gas emissions. Previously he was a journalist, based in France, and mostly writing for Le Monde. He continues to write his Le Monde blog, Oil Man, which he describes as “a chronicle of the beginning of the end of petroleum.” The original French edition of this book, Or Noir: La grande histoire du pétrole, was awarded the Special Prize of the French Association of Energy Economists in 2016. Wall Street Journal Editorial Board Meltsdown over Exxon with Bizarre Accusation: Like Cromwell Did Catholics? Oil Change International ... "Exposing the true costs of fossil fuels"
NYT: Private Empire -- "A Well-Oiled Machine"
Guardian: "Thorough and accessible portrait of a secretive corporation is fascinating and deeply disturbing"
"Coll makes clear in his magisterial account that Exxon is mighty almost beyond imagining, producing more profit than any American company in the history of profit, the ultimate corporation in 'an era of corporate ascendancy.' 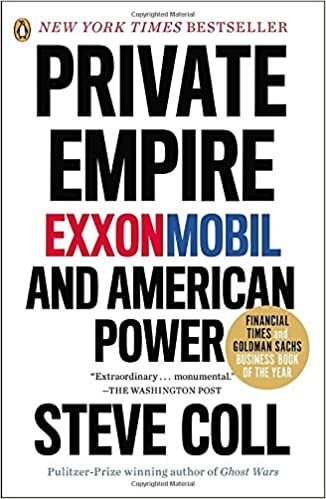 This history of its last two decades is therefore a revealing history of our time, a chronicle of the intersection between energy and politics." "Groundbreaking... Masterful as a corporate portrait, Private Empire gushes with narrative." Pages in category "Fossil Fuels"
Media in category "Fossil Fuels"
This page was last modified on 14 April 2019, at 22:19.